Well we didn't reach lock up before Christmas but the Chippies worked right up til the Thursday before Christmas getting the eaves done and building extra frame bits for our weatherboard to attach to. We were really disappointed to not have weatherboard up before Christmas and felt really frustrated at why it wasn't being done but we have since found out there were some payment negotiations going on regarding the weatherboard which delayed it slightly. Imagine how excited we were though to head out to the block last Thursday to see the Chippies back early with the weatherboard at the front already done. Totally made up for the delay. We are both really happy with it and glad we went with the bigger size weatherboard as the Scyon comes in two different sizes and I was very uncertain about which size was the "right" one I was after. Our garage was also rendered before Christmas break but the bits around the bottom of the weatherboard will get rendered after all the weatherboard is finished. 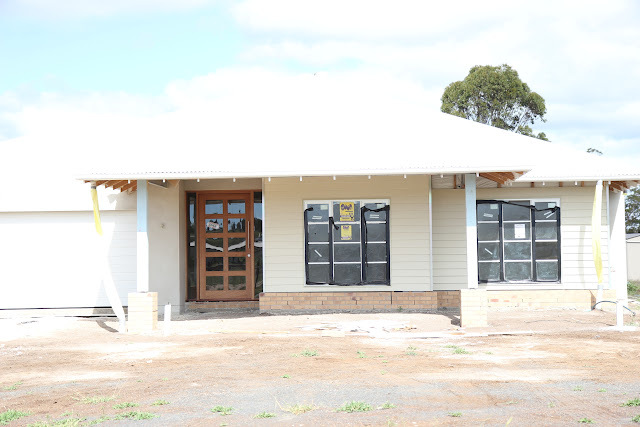 It actually already looks like it is all painted as the weatherboard and the render match in a cream colour. Garage door was put on a while back but I keep forgetting to photograph it. Just went with the standard one in simple Surfmist, nice to have one thing not to have to upgrade to achieve the right look. Close up shot of that wonderful weatherboard. Hope I'm still loving it this much when it needs repainting. Close up shot of our door handle, one of the more modern bits to our house. This was standard but we just went a little bigger. All our doors have been hung and architraves are on but not the skirtings, those will go on after our floor has been laid. I am meeting the tiler on site Thursday morning and the chippies will finish up this Friday. I still need to discuss grout colours due to us changing the floor tile but apparently he has samples for me to look at, I'm thinking a light grey. Hubby also wants a meeting with the painter before he heads off for Africa this Friday. Fingers crossed we have a good one. Will try to remember to take my camera and take some sneaky shots whilst I am out there as they have been very thorough with locking up and we haven't been able to get in at all. Reminding myself to try not to stress about things and to try and enjoy this moment in our lives after all it's not every day that one gets to experience building a house. * Had trouble uploading photos today but I will persevere and get to that post regarding kitchen and interior colour selections. Woo Hoo! Nice surprise and it looks great too! I think you'll find it will all go quite quickly from here! Exciting! Yes it was a lovely surprise. Looks lovely.. Love your entry door too.. Thanks Amy, it doesn't seem to be a common door, I certainly had no luck in googling an image of it so I am very happy with it. Beautiful! It feels so familiar to me with the weatherboard and surfmist garage door! Love, love, love it. Can't wait to hear more. That's a real house now! It is a real house now, it already looks like home. I think weatherboard just makes a house look so inviting.